Observations by NASA's Swift spacecraft, now renamed the Neil Gehrels Swift Observatory after the mission’s late principal investigator, have captured an unprecedented change in the rotation of a comet. 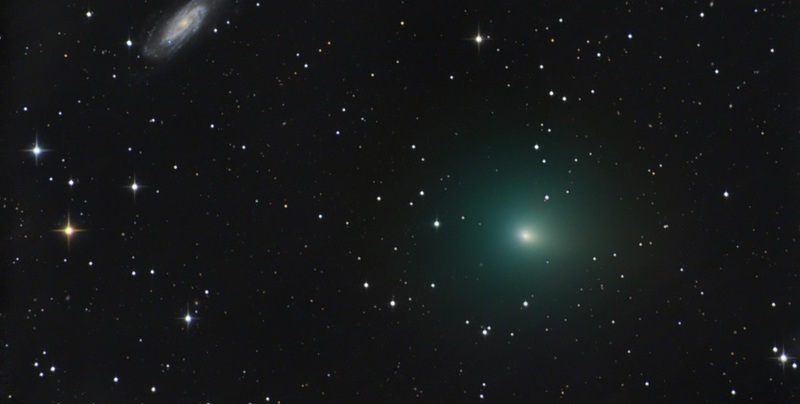 Images taken in May 2017 reveal that comet 41P/Tuttle-Giacobini-Kresák — 41P for short — was spinning three times slower than it was in March, when it was observed by the Discovery Channel Telescope at Lowell Observatory in Arizona. The abrupt slowdown is the most dramatic change in a comet's rotation ever seen. "The previous record for a comet spindown went to 103P/Hartley 2, which slowed its rotation from 17 to 19 hours over 90 days," said Dennis Bodewits, an associate research scientist at the University of Maryland (UMD) in College Park who presented the findings Wednesday, Jan. 10, at the American Astronomical Society (AAS) meeting in Washington. "By contrast, 41P spun down by more than 10 times as much in just 60 days, so both the extent and the rate of this change is something we've never seen before." The comet orbits the Sun every 5.4 years, traveling only about as far out as the planet Jupiter, whose gravitational influence is thought to have captured it into its present path. Estimated to be less than 0.9 mile (1.4 kilometers) across, 41P is among the smallest of the family of comets whose orbits are controlled by Jupiter. This small size helps explain how jets on the surface of 41P were able to produce such a dramatic spindown. As a comet nears the Sun, increased heating causes its surface ice to change directly to a gas, producing jets that launch dust particles and icy grains into space. This material forms an extended atmosphere, called a coma. Water in the coma quickly breaks up into hydrogen atoms and hydroxyl molecules when exposed to ultraviolet sunlight. Because Swift's Ultraviolet/Optical Telescope (UVOT) is sensitive to UV light emitted by hydroxyl, it is ideally suited for measuring how comet activity levels evolve throughout the orbit. Ground-based observations established the comet's initial rotational period at about 20 hours in early March 2017 and detected its slowdown later the same month. The comet passed 13.2 million miles (21.2 million km) from Earth on April 1, and eight days later made its closest approach to the Sun. Swift's UVOT imaged the comet from May 7 to 9, revealing light variations associated with material recently ejected into the coma. These slow changes indicated 41P's rotation period had more than doubled, to between 46 and 60 hours. UVOT-based estimates of 41P's water production, coupled with the body's small size, suggest that more than half of its surface area contains sunlight-activated jets. That's a far greater fraction of active real estate than on most comets, which typically support jets over only about 3 percent of their surfaces. "We suspect that the jets from the active areas are oriented in a favorable way to produce the torques that slowed 41P's spin," said Tony Farnham, a principal research scientist at UMD. "If the torques continued acting after the May observations, 41P's rotation period could have slowed to 100 hours or more by now." Such a slow spin could make the comet's rotation unstable, allowing it to begin tumbling with no fixed rotational axis. This would produce a dramatic change in the comet’s seasonal heating. Bodewits and his colleagues note that extrapolating backward suggests the comet was spinning much faster in the past, possibly fast enough to induce landslides or partial fragmentation and exposing fresh ice. Strong outbursts of activity in 1973 and 2001 may be related to 41P's rotational changes. A less extreme relationship between a comet's shape, activity and spin was previously seen by the European Space Agency's Rosetta mission, which entered orbit around comet 67P/Churyumov-Gerasimenko in 2014. The comet's spin sped up by two minutes as it approached the Sun, and then slowed by 20 minutes as it moved farther away. As with 41P, scientists think these changes were produced by the interplay between the comet's shape and the location and activity of its jets. A paper detailing these findings will be published in the journal Nature on Jan. 11. NASA's Swift spacecraft has conducted a broad array of science investigations for 13 years — monitoring comets, studying stars hosting exoplanets, and catching outbursts from supernovas, neutron stars and black holes — and it continues to be fully operational. NASA announced at the AAS meeting that the mission has now been renamed in honor of Neil Gehrels, who helped develop Swift and served as its principal investigator until his death on Feb. 6, 2017. Swift's rapid scheduling capability, plus a trio of telescopes covering optical to gamma-ray wavelengths, continues to deliver important contributions in the study of gamma-ray bursts — the most powerful explosions in the universe — while maintaining a critical role in monitoring how astronomical objects as diverse as comets, stars and galaxies change over time. "The Neil Gehrels Swift Observatory is a name that reflects Swift's current status as the go-to facility for rapid-response, multiwavelength follow-up of time-variable sources," said Paul Hertz, director of NASA's Astrophysics Division in Headquarters, Washington. "With Swift, Neil helped usher in the era of time-domain astronomy. He would have been very excited about today’s discovery." "Swift is still going strong, and we continue to receive four urgent 'target-of-opportunity' observing requests from the broader astronomical community each day," said S. Bradley Cenko, who was recently appointed as the mission’s principal investigator. "Neil’s leadership and vision continue to guide the project, and we can think of no better way to honor this legacy than with the new name." Goddard manages the Swift mission in collaboration with Penn State in University Park, the Los Alamos National Laboratory in New Mexico and Orbital Sciences Corp. in Dulles, Virginia. Other partners include the University of Leicester and Mullard Space Science Laboratory in the United Kingdom, Brera Observatory and the Italian Space Agency in Italy.